There has been new momentum at the highest political levels to put plans into place that will make the most use of the recent science showing ART itself both saves lives and stops HIV from spreading. International funding, however, remains largely stagnant across the board and will need to be increased to achieve the goals of saving more lives through treatment, while dramatically reducing HIV transmission. In its 2013 consolidated HIV treatment guidelines, the World Health Organization (WHO) is recommending a number of changes that will improve treatment in developing countries, first and foremost earlier initiation of treatment at a threshold of CD4 cell count of 500 or below. The new guidelines also recommend ART for life for all pregnant women with HIV (‘Option B+’) in countries with generalised epidemics, and as an option for all countries, as well as immediate treatment for HIV-positive individuals with HIV-negative partners (‘sero-discordant’ couples). These recommendations increase considerably the number of people on treatment, with WHO estimating in 2012 that around 25 million people could be in need.3 WHO also recommends routine viral load monitoring in order to detect and correct adherence problems as they arise, or switch people to alternative treatment if necessary. Further, tenofovir (TDF) is the clear preferred first-line regimen for adults, while treatment recommendations for children are simplified and strengthened, with ART recommended for all HIV-positive children under five years of age, and a boosted protease inhibitor recommended for all children under three. Because millions of people need to be initiated and sustained on treatment regimens for life, it is as critical as ever to ensure ARVs are affordable. 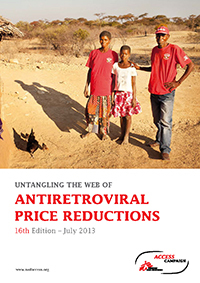 Competition among generic producers was instrumental in bringing down the price of the first generation of ARVs, and is one of the key reasons treatment could be scaled up to millions of people. Today, first-line ART is available for just under US$100 per person per year (ppy), which is a 99% decrease from 2000, when treatments still under patent were priced at more than $10,000 ppy. But the situation today is different and the progress achieved is once again under threat. Key countries, especially India, where generics are produced, now grant medicine patents in order to comply with their international obligations as members of the World Trade Organization (WTO). Newer ARVs are already patented in these countries, meaning that production of affordable generic medicines is now restricted, keeping monopoly prices high. With upwards of 55 million people expected to need ARV therapy by the year 2030,4 global patent rules are contributing to a looming crisis as current drugs lose their effectiveness and their newer, patented replacements are priced out of reach for all but the wealthy. While the prices quoted by manufacturers for first- and second-line regimens continue to fall—largely thanks to the impact of generic competition with new suppliers entering the market—the prices of the newest drugs continue to be astronomically high, primarily because of patents in producing countries such as India that block generic competition. And while the Indian Supreme Court’s decision to reject Swiss pharmaceutical company Novartis’s attack on India’s patent law will safeguard first- and second-line ARVs currently in generic production, additional threats to access to medicines loom large in the form of patents covering new compounds, restrictive provisions in free trade agreements which include additional intellectual property obligations that block generic competition, and voluntary licence agreements between originator and generic drug producers that exclude many countries where people with HIV live.